Are you looking for a refreshing cocktail for the spring and summer? I’ve got the perfect thing for you. Lavender is a personal favorite of mine and I love incorporating it where I can. I also love a refreshing lemonade so I combined the two for this perfect light thirst quencher for the warmer weather. This first part of this recipe is to infuse your favorite vodka with lavender. If you’re making these for a specific event you will want to do this about a week ahead of time. The first step is to use the funnel to simply add the lavender into your bottle of vodka. Shake the bottle well and set aside for at least five days. You will want to shake the bottle again at least once a day while the flavor infuses. Once the lavender has had time to steep use the strainer to remove the buds and larger pieces from your vodka. After that use a cheese cloth or coffee filter to remove the small particles left over and pour into your favorite bottle! For the purpose of this I actually let mine sit for about two weeks since I do not add extra lavender oil to flavor. For my lemonade I opted to make it using simple syrup at the suggestion of a friend in the food and beverage industry. It’s super simple to make if you never have before! The amount you use for this of course depends on how much you actually want to make. For mine I used 1 cup of each. You can also amp up the lavender flavor by adding more lavender to the simple syrup while it simmers or lavender oil. This is also an option if you will be making a non alcoholic version. Make sure to strain any lavender out afterwards. Place the sugar and water in a sauce pan and bring to a simmer until the sugar is completely dissolved. Then let it sit and cool. I juiced six lemons and mixed it with about 5 cups of sparkling water. The amount of water you will want to add depends on how strong you like your lemonade. You can either buy your sparkling water or if you have a soda stream like I do, make it yourself. If you are making this as a non alcoholic drink you can add lavender oil straight to the lemonade. After that mix in your simple syrup and stir! 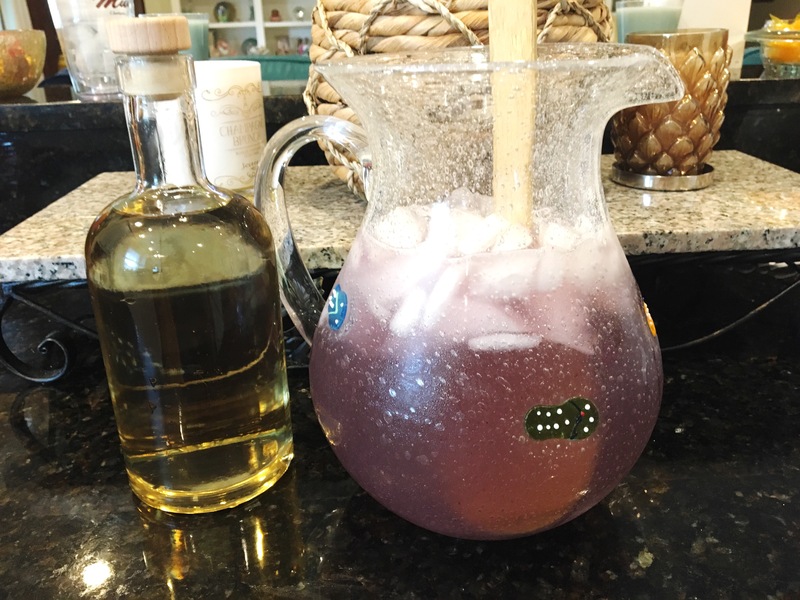 Since this lemonade was going to be shared by kids, the adults added the vodka to their individual drinks (this is why the lavender was also only in the vodka). Garnish with lemon slices and/or lavender sprigs and you’re all done! Optional: After adding the water place a drop of purple food coloring in and stir. Continue adding until you reach the color you like. Does the pie in the picture above look tasty? Check out our Tomato Pie recipe to make your own!